Heavy-handed Hillsong: Houston releases his lawyers on Mr West. The question is often asked why we remain anonymous. This article shows what happens to those who ask too many questions publically. Quite a while ago, we looked at Steve West (formerly involved in ministry at Hillsong) and the Australian media that exposed the problematic behaviour found in Hillsong and its leadership. 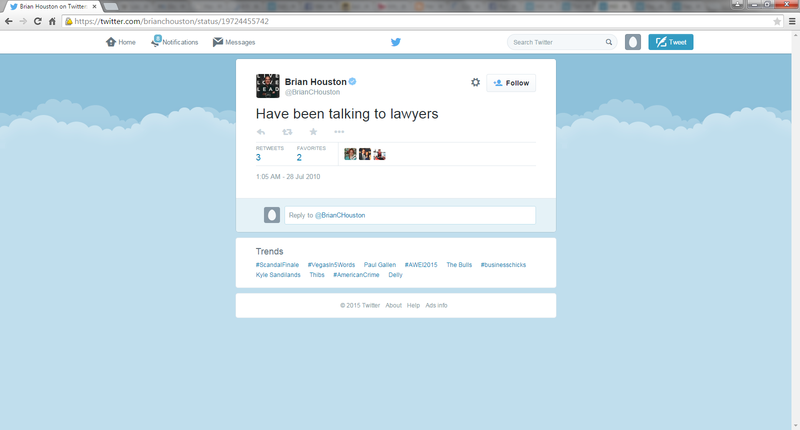 What did Brian Houston hope to achieve by publicly tweeting this? Is this as an act of intimidation towards Steve West? 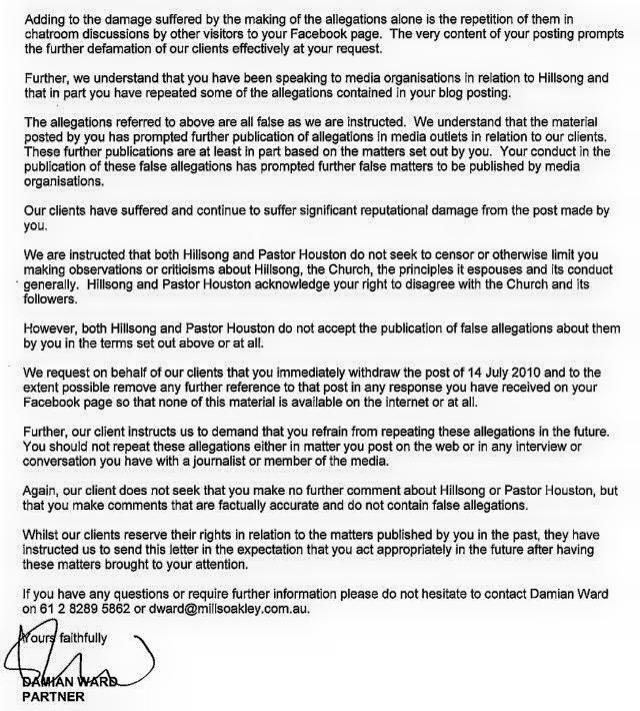 We recently came across this letter that Steve West received from Hillsong’s lawyers back in 2010. The articles that Houston has personally responded to in the letter are the articles we have posted from Steve West (listed above). We act for Hillsong Church and Pastor Brian Houston. Our client has referred us to Facebook postings lodged by you and in particular a posting made on 9 July 2010 at 11.45 pm. That posting has prompted significant further chartroom dialogue from others. 9. Hillsong is a “con”. The allegations contained in your post are defamatory of both Hillsong and Pastor Houston. The allegations are extremely serious as they contend that both Hillsong Church and Pastor Houston behave dishonestly and disreputably in their conduct. Adding to the damage suffered by the making of the allegations alone is the repetition of them in chatroom discussions by other visitors to your Facebook page. The very content of your posting prompts the further defamation of our clients effectively at your request. Further, we understand that you have been speaking to media organizations in relation to Hillsong and that in part you have repeated some of the allegations contained in your blog posting. The allegations referred to above are all false as we are instructed. We understand that the material posted by you has prompted further publication of allegations in media outlets in relations to our clients. These further publications are at least in part based on the matters set out by you. Your conduct in the publication of these false allegations has prompted further false matters to be published by media organizations. Our clients have suffered and continue to suffer significant reputational damage from the post made by you. We are instructed that both Hillsong and Pastor Houston do not seek to censor or otherwise limit you making observations or criticisms about Hillsong, the Church, the principles it espouses and its conduct generally. Hillsong and Pastor Houston acknowledge your right to disagree with the Church and its followers. However, both Hillsong and Pastor Houston do not accept the publication of false allegations about them by you in the terms set out above or at all. We request on behalf of our clients that you immediately withdraw the post of 14 July 2010 and to the extent possible remove any further reference to that post in any response you have received on your Facebook page so that none of this material is available on the internet or at all. Further, our clients instructs us to demand that you refrain from repeating these allegations in the future. You should not repeat these allegations either in matter you post on the web or in any interview or conversation you have with a journalist or member of the media. Again, our client does not seek that you make no further comment about Hillsong or Pastor Houston, but that you make comments that are factually accurate and do not contain false allegations. Whilst our clients reserve their rights in relation to the matters published by you in the past, they have instructed us to send this letter in the expectation that you act appropriately in the future after having these matters brought to your attention. If you have any questions or require further information please do not hesitate to contact Damian Ward on 61 2 8289 5862 or dward@millsoakley.com.au. Since the 2014 Royal Commission which was looking into Hillsong’s handling of the Frank Houston scandal, we have obtained a letter written by Brian Houston to “encourage” his church to “rise above” increasing “opposition”. 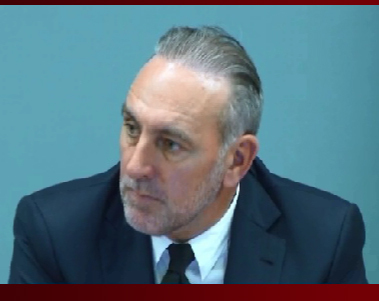 “I swear by almighty God that the evidence I shall give in this Royal Commission shall be the truth, the whole truth and nothing but the truth.” – Brian Houston, Royal Commission. 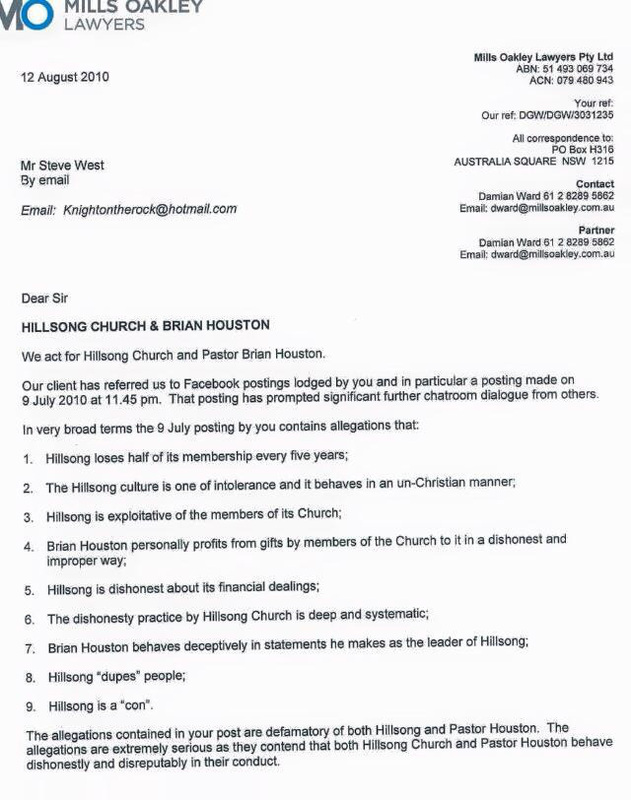 The below letter offers a glimpse into the modus operandi of Brian Houston and Hillsong’s leadership between 1998-2004. It is interesting comparing this to the information disclosed at the Royal Commission in 2014. 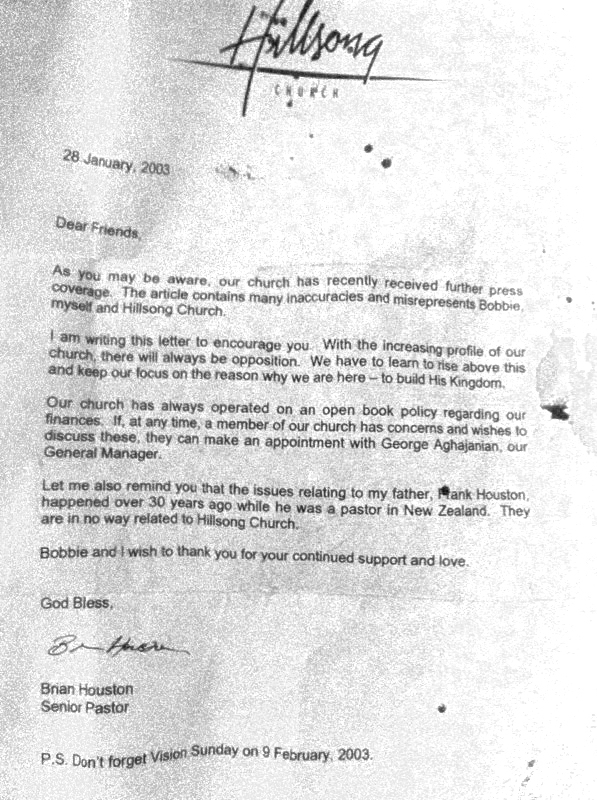 Brian Houston mailed the following letter to Hillsong members back in 2003. As you may be aware, our church has recently received further press coverage. The article contains many inaccuracies and misrepresents Bobbie and Hillsong Church. I am writing this letter to encourage you. With the increasing profile of our church, there will always be opposition. We have to learn to rise above this and keep our focus on the reason why we are here – to build His Kingdom. Our church has always operated on an open book policy regarding our finances. If, at any time, a member of our church has concerns and wished to discuss these, they can make an appointment with George Aghajanian, our General Manager. Let me also remind you that the issues relating to my father, Frank Houston, happened over 30 years ago while he was a pastor in New Zealand. They are in no way related to Hillsong Church. Bobbie and I wish to thank you for your continued support and love. P.S Don’t forget Vision Sunday on 9 February, 2003. “By the way I had to confront my own father. Again, hardest day of my life. I talked to [Frank Houston] about this, he had just come back from overseas. In my office, he went all dry in the mouth. You ever talk to your hero and your father about something so horrible and-? He went all dry in the mouth and he confessed that that had happened, all those years before. Below are articles from various news outlets. THE Pentecostal Christian movement led by Hillsong Church founder Brian Houston told its ministers “we cannot see any reason” for the serial child abuse committed by his father to be publicly announced, a royal commission has heard. A letter sent on Christmas Eve 2001 to every minister of the Assemblies of God in Australia movement said “We are aware that the above information may be a surprise and shock to some of you. “We cannot see any reason for this to be announced to your church or further afield. Sadly there are always one or two people with their own agendas who will try and get mileage from other people’s pain,” the letter said. The letter, tendered in evidence to the Royal Commission into Institutional Responses to Child Sexual Abuse, does not detail the offences committed by Brian Houston’s father, William Francis ‘Frank’ Houston. Brian Houston, the then national president of the Assemblies of God, had received “a serious allegation” about his father in 1999, the letter said. The commission has heard this was that Frank Houston had sexually abused a seven-year-old boy decades before, which the older man subsequently admitted. The Assemblies of God subsequently investigated “claims of serious moral failure” by Frank Houston, the letter said, although it provided no details of what these were. The commission has heard these were allegations that Frank Houston had sexually abused six other children in New Zealand several decades before. “Obviously both these circumstances have brought great anguish to our National President and I would encourage you to give him your prayer and support,” stated the letter, sent by the Assemblies of God vice-president, John Lewis. 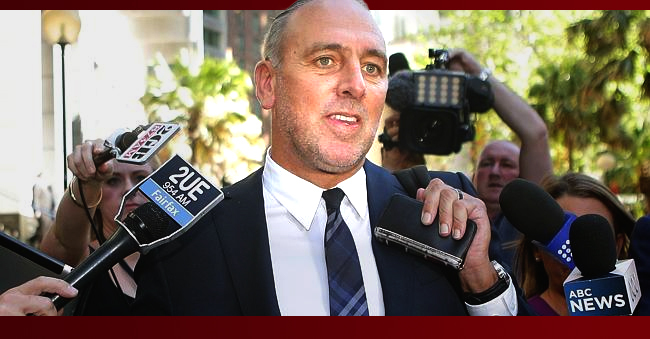 Brian Houston had forced his father to stand down as a preacher after the 1999 allegations, the commission has heard. Frank Houston subsequently left the organisation and died in 2004. The commission has heard there is no evidence the allegations against Frank Houston were reported to police. Pastor Barbara Taylor, who initially raised the abuse allegations with the Assemblies of God national executive, “hadn’t been told” what action was taken as a result, she told a hearing of the commission in Sydney this morning. “I though things were just going on as normal and I didn’t think that was proper. She later “heard a whisper (about the New Zealand allegations) but nothing official … I wasn’t told anything,” Pastor Taylor said. A week after Brian Houston first stood his father down, Pastor Taylor said she “heard from people with knowledge of the problem” that he was still preaching publicly, but that she did not have any evidence of this herself. Brian and his wife Bobbie Houston took over the running of his father’s Sydney Christian Life Centre in 1999, the commission has heard, subsequently merging it with their own Hills Christian Life Centre and renaming the organisation Hillsong Church. Brian and Bobbie Houston remain central to the working of the church, which now operates in 12 countries, the commission has heard, and generates millions of dollars in revenue each year. The hearing continues.